The forty contributions to this voluminous collection give a remarkable insight into the trials and tribulations of a South African township. 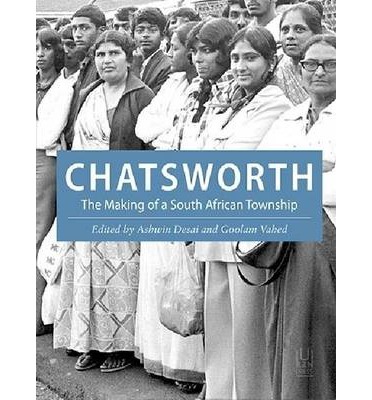 Comprising academic studies, personal essays, and eye-witness reports on Chatsworth and its residents, the richly illustrated volume spans large chunks of the history of the township and its multitude of residents since its inception in the early 1960s. Purely factual accounts are interspersed with vibrant narratives, like the one offered by the playwright Ronnie Govender who captures the spirit of the entire book by writing that a “ghetto is designed to kill the spirit of its hapless denizens … Chatsworth is one of those ghettos that refused to buckle.” Nearly all pieces in the book convey this message of survival against all odds. Each of the local and international contributors approaches the township from a different angle. Many pieces centre on historical events and socio-political processes which shaped the area, first and foremost the initial forced resettlements around which all other memories evolve. One report examines the protests which dominated the early 1970s against plans to ban private bus companies from Chatsworth. Others write about specific individuals and entire movements which have been combating the appalling living conditions in the township. They zoom in on the daily struggles of ordinary people facing displacement, dire poverty, unemployment, gang culture, drug abuse, or different forms of exploitation. There is an account of the horrific incident which shook Chatsworth on 24 March 2000 when thirteen teenagers were killed in a stamped at a nightclub. The tragedy was a wake-up call for the community to rethink the infrastructures available to young people in the township. Such reports are contrasted with stories about people hailing from Chatsworth who have made a great success of their lives, like Kumi Naidoo, the present International Executive Director of international environmentalist group Greenpeace, or Kerishnie Naiker, Miss Africa of 1997, who through her Welfare Initiative has initiated and facilitated the building of the Chatsworth Youth Centre. Reading about the uplifting role cricket and football played in the lives of Chatsworth’s players, their teams, and the communities which supported them makes one furious about the carelessness with which sports at school level have been dealt with by the post-apartheid dispensation. More inspiring is the story of the Denny Veeran Music Academy where legions of musicians are being taught to reach for their dreams. The book includes a captivating photo essay by Jenny Gordon which focuses on the centres of worship in Chatsworth. It is a welcome companion to the few contributions which describe the religious make-up of the township and the challenges the various groups of worshippers encounter in their quest for spiritual guidance. Chatsworth: The Making of a South African Township is not exactly a leisurely read and will not be of much interest to a general reader. For anybody wanting to look into the inner workings of a township, it will be a treasure trove of information and impressions. In this respect, I felt highly enriched by the book. Review first published in the Cape Times on 2 May 2014. This entry was posted in What I've Read, What I've Written and tagged academic studies, against all odds, Ashwin Desai, book review, Cape Times, centres of worship, Chatsworth, Chatsworth Youth Centre, cricket, Denny Veeran Music Academy, dire poverty, displacement, drug abuse, exploitation, eye-witness, football, gang culture, ghetto, Goolam Vahed, Greenpeace, historical events, illustrated, Jenny Gordon, Kerishnie Naiker, Kumi Naidoo, Miss Africa, personal essays, photo essay, protests, remarkable insight, review, Ronnie Govender, socio-political processes, South Africa, South African township, sports, survival, The Making of a South African Township, township, trials and tribulations, unemployment, University of KwaZulu-Natal Press on May 22, 2014 by Karina.